People often use the words “breathtaking” and “awesome” to describe the unspoiled beauty of California’s Shasta and Cascades area. It is the epitome of “wilderness,” and it’s almost hard to fathom this area exists in the same state as San Francisco and Los Angeles. 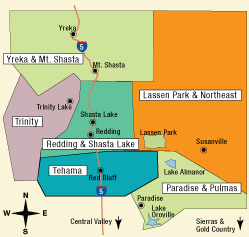 The Shasta and Cascades area is home to seven national forests, several national and state parks and a portion of the Cascades Mountain range that includes two glaciated volcanoes: the still-active 10,457-foot Lassen Peak and dormant-but-imposing Mt. Shasta, which rises a majestic 14,162 feet into the air. A unique way to enjoy the area is offered on select weekends by the non-profit Wildhorse Sanctuary in Shingletown. Two or three-day trail rides and evening barbeques complete with singing and storytelling complement overnight accommodations in rustic, lakeside cabins. The area is rich in Indian and pioneer history, and the present-day ranch house was once a circuit court — complete with hanging tree! Other historical references can be experienced in and near the city of Red Bluff. An outstanding collection of restored Victorian homes remain from the city’s Gold Rush transportation hub days, and the Kelly Griggs Museum provides a look at 1880s daily life. Just north of Red Bluff, the restored adobe home of the first and only President of the California Republic, William B. Ide, is open for tours in what is now a state park. In Weaverville, another state park is home to Joss House and California’s oldest continuously operating Chinese temple. In addition to the history and natural beauty, there are modern-day wonders to enjoy in the area, as well. In Redding, don’t miss the $23M Sundial Bridge that is more sculpture than sundial (it’s only an accurate timepiece one day of the year, the summer solstice) and the surrounding Turtle Bay Exploration Park.